Hill Country Village offers a variety of indoor and outdoor settings to compliment your wedding, reception or special event. 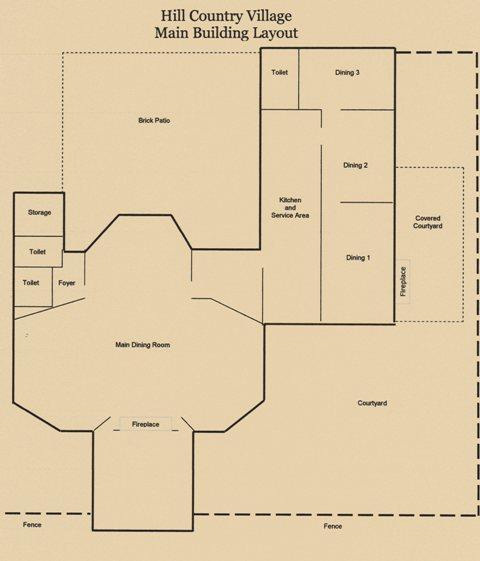 Below is a site plan as well as a detailed layout of the main building and service area. Please contact us to arrange an appointment to visit our facility. Old Country Store - This building was the commissary on the Robson Cupples Plantation. It was moved to Hill Country Village in 2002. We don't have an exact date of construction, but we believe this building is over 100 years old. The flooring and shelving inside are original. The front courtyard is often used for outdoor ceremonies. Country Cottage - This building was also moved from the Robson Cupples Plantation. It is now Bill Kelly's office. Water Tower Barbeque Area - This area of the property is a great place to "hang out." It is open air and includes bar tables and numerous farming related antiques. Guests always find this area and use it as a conversation space. Flagstone Pavilion - This area is used for outdoor seating. It's a flagstone patio covered by a pavilion roof with fans and lighting. 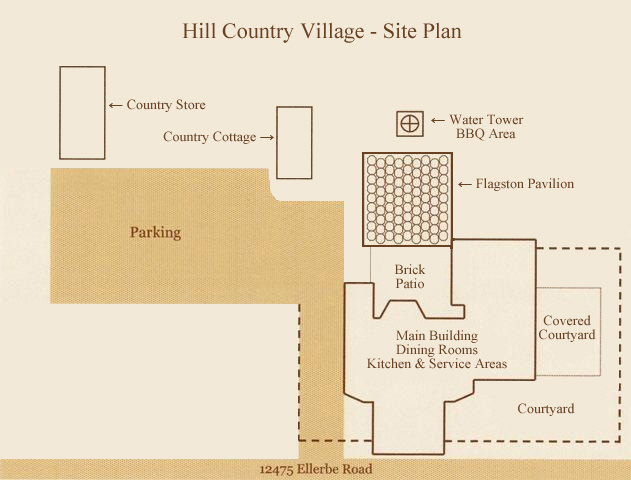 Main Building - Our reception building is the cornerstone of Hill Country Village. It was originally a 1930 era store and filling station. The owners used the front as their retail area and the back as their living quarters. Main Dining Room - This area includes our full bar, a dance floor and a stage. We often use this area as well for "cutting the cake." Dining 1 and Dining 2 - These room provide indoor seating for dinner. Dining 3 - This room is often used as the bride's dressing area because of the adjacent bathroom. Otherwise, it is more indoor seating. Courtyard - The outdoor area includes many tables and chairs for outdoor dinner seating. Covered Courtyard - Our food buffet is normally set up under the covered patio.